The officers; the state staff; that's the way we became the S.O. Bunch! 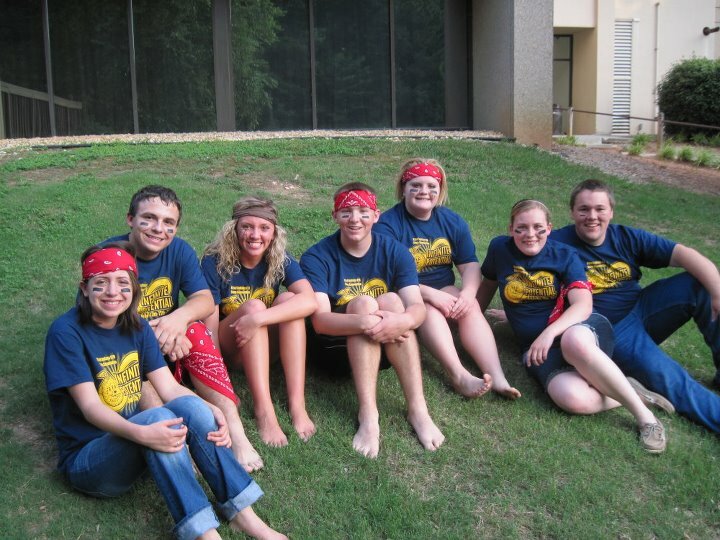 This parody of the famous Brady Bunch theme song kicked off SOAR 2011. But why would we begin one of our camps with a parody of one of the most chastised television sitcoms in the past 50 years? Because it is Legen- wait for it.... and I hope you are not lactose-intolerant because the last part is... dary! 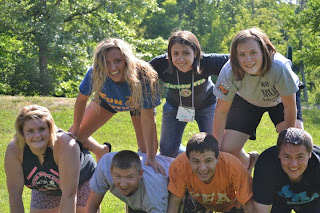 On a serious note, the real reason that we decided to mimic the Brady Bunch involves our camp content. 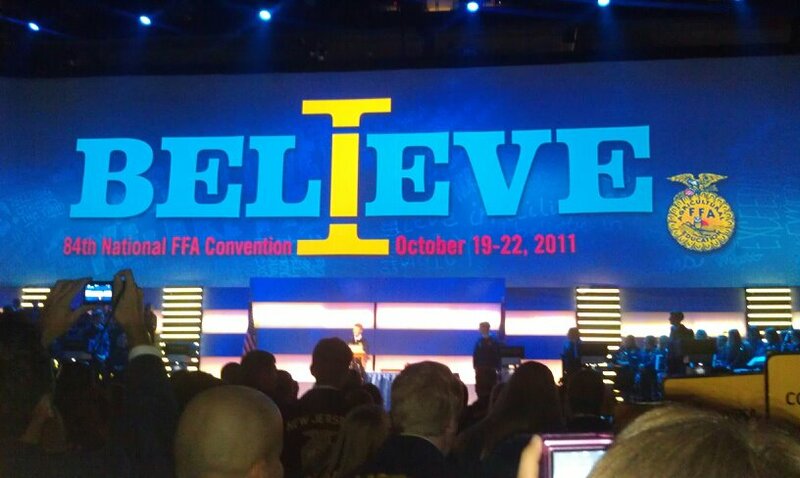 Indiana FFA conferences have changed quite a lot in the past 15-20 years. 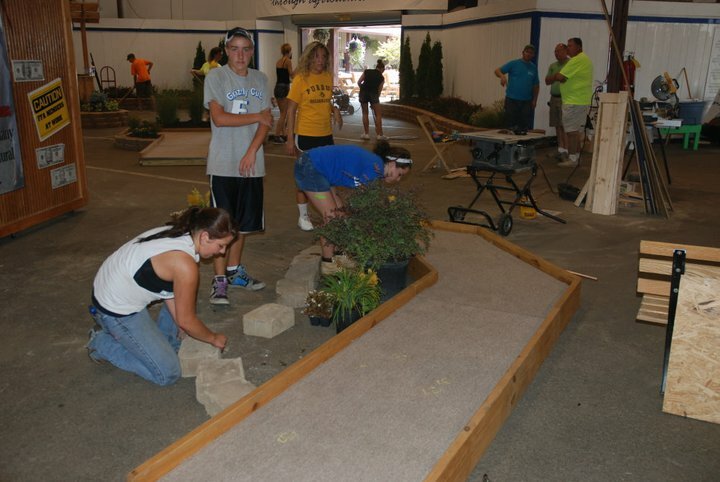 In the past, conferences had parli and quiz bowl contests to better teach members about the basics of FFA. We decided to bring these contests back at SOAR this year. While the contests still have a few kinks that need to be worked out, we believe that most of our SOAR attendees enjoyed these contests. So when we decided to go back in time with content, we also decided to make our theme vintage and retro. This meant that our breakout group names were old tv sitcoms, so we had groups like M*A*S*H, I Love Lucy, Leave it to Beaver, Gilligan's Island, and the Munsters! procedure contest. They were the champions! Another retro idea that returned to SOAR was the Top Leader Award. Campers voted on two members of each group as a "Top Group Leader." With 14 groups, we had 28 Top Group Leaders. Then there was another round of voting to determine the 4 "Top Leaders." After voting ended, it was announced that Bender Smith from Tri High, Mallarie Stookey of Warsaw, Syx Russel from STAR Academy, and Morgan Moore from Western Wayne were all top leaders! Congratulations to them!!! And of course, one of the most exciting moments of the entire conference was at the banquet, when the Truck Stampede drawing was held. A winner was drawn, and all 300+ banquet guests congratulated the winner via phone. The ticket was sold by a member from the Shenandoah FFA chapter. All in all, there were well over 250 members in attendance at SOAR 2011, and we really hope that it was Legendary for all! Many, many Truck Stampede Tickets were sold!!! Gianna Hartman leads SOAR Campers through the Personal Growth session. The past week and a half we have been focusing entirely on SOAR. We are so excited about our upcoming conference. SOAR stands for Seeking Opportunities, Achieving Results. It's aimed towards first year FFA members to inform them about what FFA is and the opportunities available to them. Here's a sneak peak of the conference. Our theme this year is "Legendary Leadership: Kickin' it Old School." I am stoked about this theme. The reasoning behind it is that we're taking this conference back to the way they used to be. We will be having a Parliamentary Procedure contest between all of the groups. We're also going to have a Quiz Bowl contest that students will compete in individually. 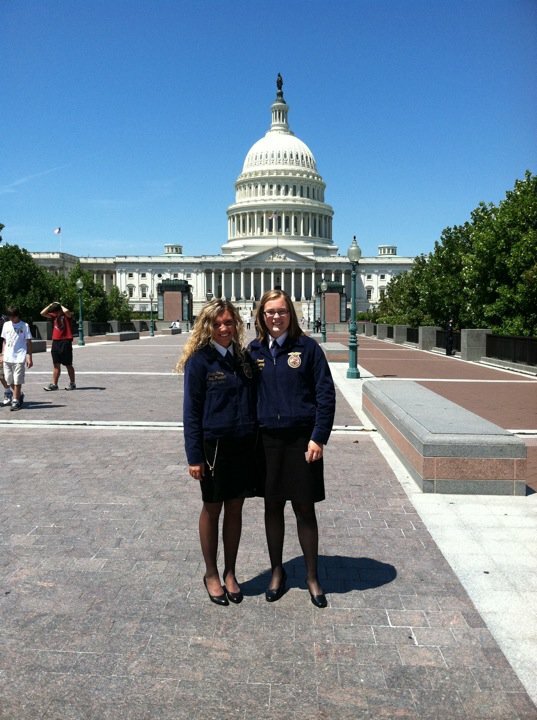 We're hoping that by having these contests, members will be more excited about FFA. It will definitely be a lot of work for the members. However, we're hoping they will develop pride for the organization through their work. I cannot wait. Even though SOAR preparations are still underway, FIRE is going to be approaching before we know it! I hope everybody is as excited about our upcoming conferences as we are! Can you believe it's November 1st? Seems like only yesterday the seven of us were standing on the stage at Purdue University.. and now only a few months down the road we have traveled thousands of miles, met hundreds of new people, and our lives have been forever changed by this once in a life time experience. Not just anyone can say they took off a year of college to serve the greatest organization in the country.. the FFA! I'd like to use this blog to wrap up the year.. I'm aware it is only November but this month is a great time to remember what we are all thankful for. I know I am thankful for this position I have been given and I know the other six officers feel the exact same... In June our lives were changed forever and I would like to recap all that has happened since this exciting day..
We moved into the state officer house two days after we were elected and from there the adventure has not stopped. We started BLAST off training where we spent a few days learning more about each other. Then we headed off to Peachtree City, Georgia. Here we spent a week with other state officers from Georgia, South Carolina, North Carolina, and Florida. This was the National Leadership Conference for state officers where we participated in team building exercises and had a lot of fun in the Georgia sun! July brought more fun for the state officers.. we prepared our first conference..Summer Challenge was a way to get FFA members active even when they are not in school! 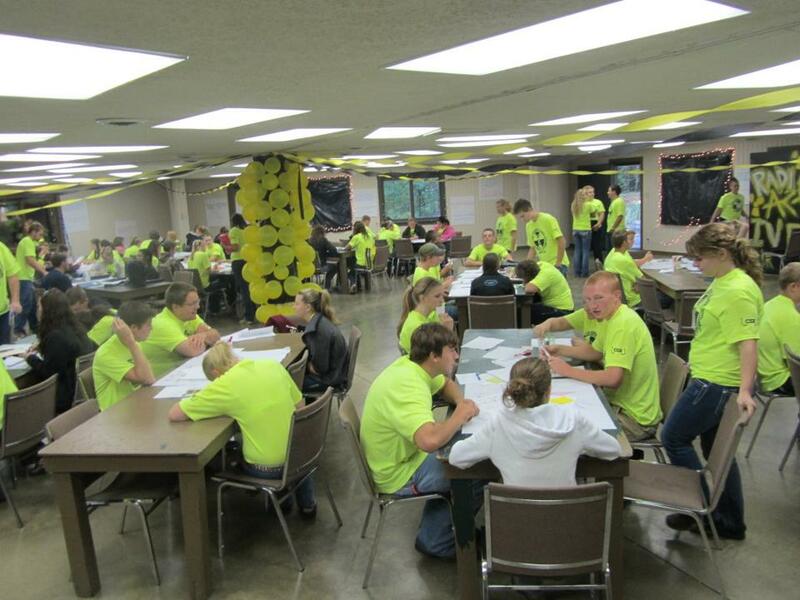 FFA members from around the state came down to the FFA Leadership Center in Trafalgar for a 3 day conference. 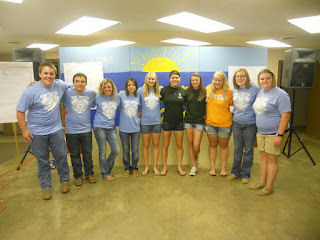 We were all really excited to host our first camp and interact with our FFA members! Summer Challenge was a total success and a great first conference! After Summer Challenge Sarah and I headed off to Washington D.C. for the State Presidents Conference! We had lots of fun meeting all the other state presidents and state secretaries from around the United States! After we returned home we all started getting ready for a huge month of our lives .. August.. also known as the Great Indiana State Fair!! The seven officers along with help from all 12 districts manned the FFA Pavilion at the Indiana State Fair.. one of the largest buildings.. and in our opinion, the most fun! We set up a petting zoo, a stage with live concerts put on by our own FFA talent members, a country market, a full size putt putt golf course, a play ground and lots of ways for the public to learn about what we love most, agriculture and FFA! 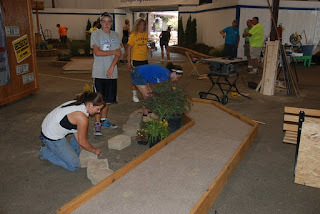 We spent a month at the Indiana State Fair and worked every day at the FFA pavilion. 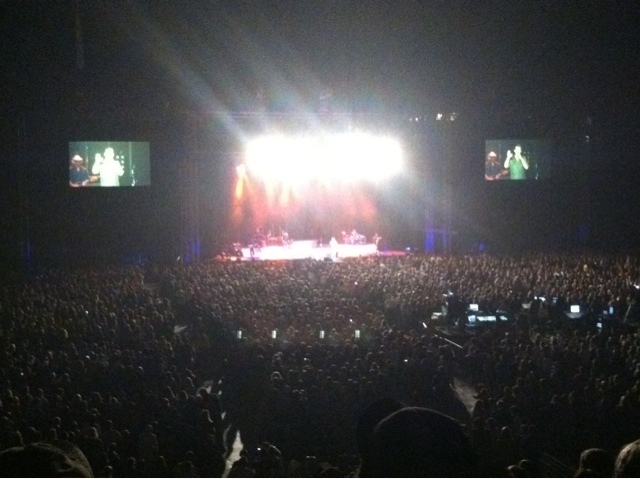 Right after we wrapped up state fair we headed to Atlanta, IN for a few days at Becknology days! We worked a booth for Indiana FFA and sold truck stampede tickets to benefit the Indiana FFA Foundation. Shortly after we left Atlanta we packed up and headed over to the neighboring state of Illinois! There we spent a week working with the Illinois state officer team hosting the Titan Tire Auction. The money made at this 2 day auction at the National Farm Progress Show would be split between the two state's FFA associations! 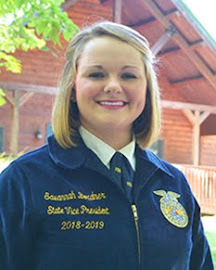 After Farm Progress Show we came back here to Indiana and got ready for our next conference.. Premier Leadership Training.. Morgan Gadd our 2011 National Officer Canidate facilitated and planned the conference and the seven state officers assisted her in many sessions. When PLT was all said and done we got ready for possibly the most exciting time of our year.. chapter visits and district kick offs!! We started our three week journey up by Chicago visiting schools and giving our presentations about self awareness and goals. 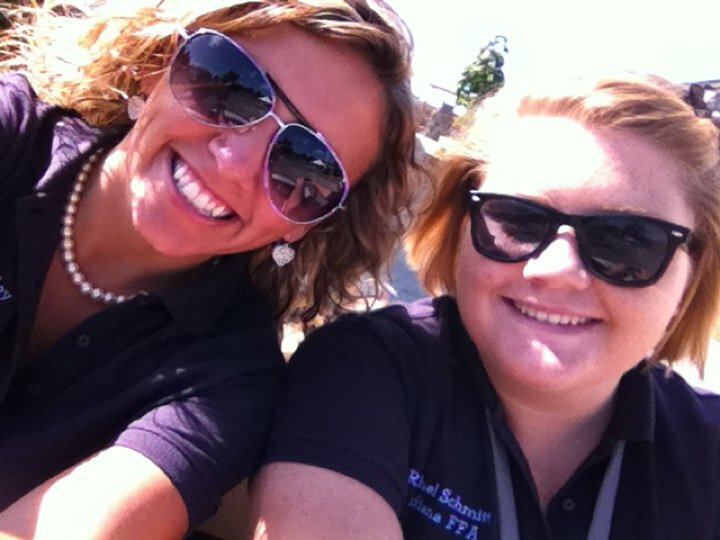 The first week we visited schools from north west Indiana all the way down to Evansville. The next week we started up by South Bend and ended all the way down by Corydon. And our final week we started up in the north east corner and ended down in the south east corner of our state. 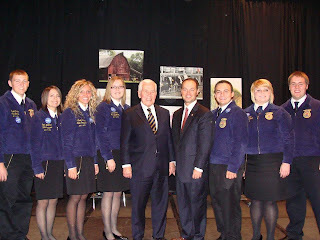 In these three weeks we visited thousands of students and members of the FFA. 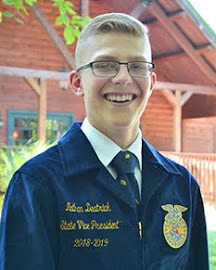 In the evenings we participated in each district's kickoff.. We went from district 1 to 12 and had a lot of fun teaching FFA members about some conferences we have, some career development events they could compete in and informing them on all the ways they could get connected with Indiana FFA by social media! These three weeks we enjoyed getting closer with members and meeting lots of new ones! And of course we just finished up with National Convention.. the one time of year FFA members from across the United States come together to celebrate FFA and Agriculture.. We had an amazing week in Indy and all were inspired by the speakers we heard and the people we met. After a week in down town Indianapolis I know that we all "Believe"..
And here we are.. November 1st.. wow, has time really flown by this fast? What is next? you might ask.. well it is that time of year! The seven state officers have conferences on the brain.. we have two camps coming up in the next month. S.O.A.R. is November 18-20 and F.I.R.E. is December 2-4.. Look for lots of fun and excitement to come from Trafalgar in the upcoming weeks.. I know it has not even been half a year.. but it has been one of the best years of my life.. and I feel so incredibly blessed and thankful for this opportunity! As I write this blog, I am currently sitting in a McDonald's. How ironic right? Like Gianna has already described, the state officers are currently smack dab in the middle of our chapter visit tour, aptly named the Impact Express. 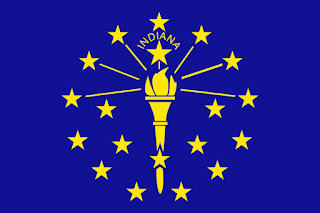 While on this tour, we will visit somewhere between 65-75 chapters all across the great Hoosier State, and easily talk to more than 1500 students. To say this is an experience we are all excited for would be an understatement. What is more exciting than driving the "Crossroads of America" from top to bottom 3 weeks in a row in order to promote ag education, FFA, and personal growth? That's right, hardly anything, except for IPFW Mastodons basketball, FFA National Convention, Monopoly at McDonald's, Stormchasers on the Discovery Channel, and the new season of Glee. (Ok, I'm totally kidding about the last one.) As I have traveled across our great state, I have realized that the Crossroads of America statement is completely true. Rachel and I had the great opportunity last Tuesday to visit the Benton Central FFA Chapter just north of West Lafayette in District IV. When we pulled into the parking lot at the school, we noticed something different about the landscape. There is a wind farm located directly behind the school. How neat is that!? Right then, we made it our goal to get up close and personal with a wind turbine that day. On our drive towards Lafayette for District IV Kick-off, we went road farming, and pulled off of US 52 and on to a country road. We just wanted to take a picture of the wind turbine we could get closest to. And close we got. We saw a gravel access road that led us right up to the base of the wind turbine! It was a sign that we needed to drive right up to this turbine. Think of Jack and his infamous beanstalk. It grew to the Kingdom of the Giants in the sky. Every person hearing the story knows that Jack has to climb the beanstalk into the sky regardless of what will happen in the end, because well, he just has to. And so we drove down the access road. And parked less than fifty feet away from the bottom of the turbine. Wind turbines are incredible structures, and this one was no less. Standing directly under the blades of the turbine, you realize the sheer power of these structures. Surprisingly, there is no whooshing noise and no wind being created from the spinning blades. It really is incredible. After snapping a few photos, we left the turbine. On Thursday, Jake and I visited District X, which was an absolute blast! We had a morning visit at Northeast Dubois, and then we left for Gibson Southern. As we approached Gibson Southern, worried that we may have been running late, I told Jake (our driver) that we should ignore a road closed sign because we could probably get through with local traffic. Bad decision on my part. We drove a few miles down highway 168 towards Fort Branch, and then saw that the road ahead of us was nothing but dirt and heavy machinery. The road was truly closed; it was hardly there. And so we immediately took a left turn on a gravel road, which was more tar than gravel. While Jake complained about the tar on his car and I sat sullenly thinking about my poor decision to skip the detour, we both burst out laughing. It was truly funny how cruddy this road was. That's when I realized that it didn't matter that I had made a navigational error. We were having a more memorable experience on one of the true Crossroads of Indiana. We ended up being early to Gibson Southern, and I doubt Jake or I will ever forget that awful gravel road. It isn't always the final destination that we will remember. Many times it's the experience of getting to that destination that will be more memorable. New Officers and New Posts! New posts from the 2011-2012 FFA State Officers coming soon! 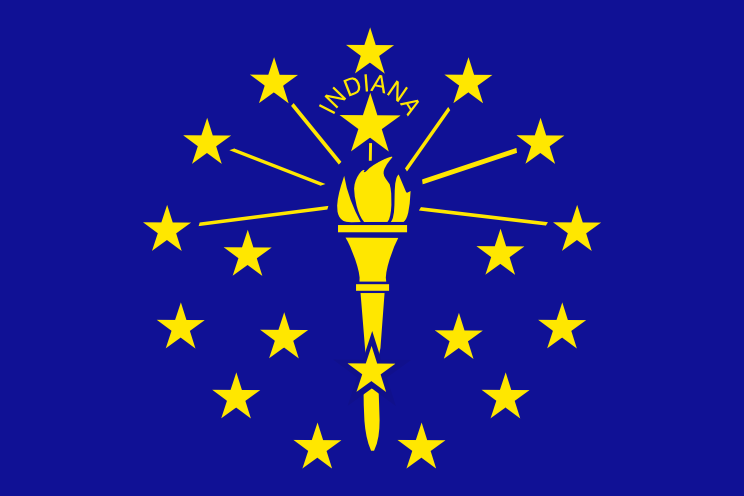 This weekend marks when Indiana will come alive, a phenomenon in the racing world will take place, and Indiana FFA State Officers and members will be present – it’s the Indianapolis 500 at the Indianapolis Motor Speedway in Indianapolis, Indiana! The FFA members will be working with Farm Journal to promote agriculture and FFA on Friday, Saturday, and then race day on Sunday. 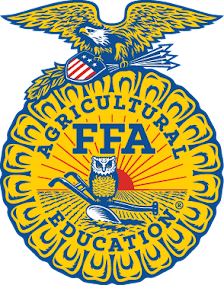 Members from Danville FFA, North Miami FFA, Carroll @ Flora FFA, and Fountain Central FFA have signed up and will be representing their Chapters as well as FFA this weekend. Upon members volunteering a total of ten hours, they will be receiving a free ticket to the race on Sunday. Since this is the first time this opportunity has been available to us, we are looking forward to getting feedback from those who participate this year as well as Farm Journal to see how we can grow the partnership and promote racing and agriculture together! Happy Indy 500 weekend, everyone! This year has been an amazing journey! We have traveled all over the state, met so many great people, and made memories that will last a life time. 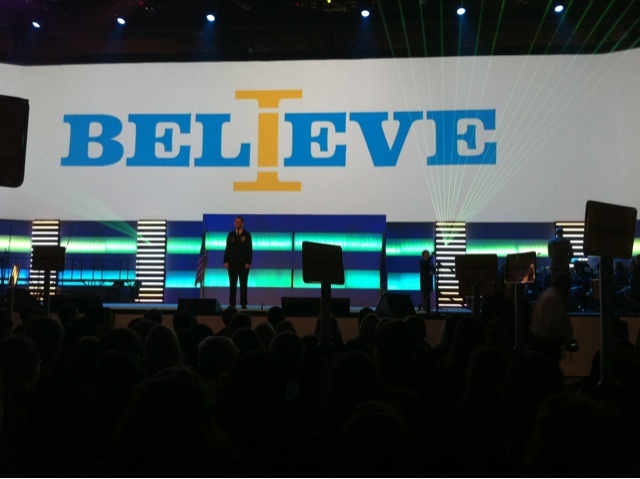 We have one MAJOR event in front of us and that is the 82nd Indiana FFA State Convention. With our thirty remaining days we will be wrapping up session scripts, awards, sponsor recognition, speeches, workshops and other odds and ends for the state convention. 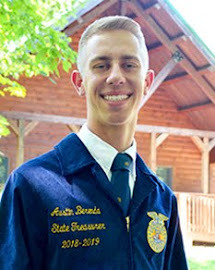 State Convention will be our team’s final three days but it will be some of the best three days for one major reason, we get to pass it on…the memories, traveling adventures, great people and the opportunity to make a difference to the new state officer team that will be elected at state convention. Being apart of the largest youth organization in the world is an honor. To those who aren’t familiar with the FFA and what it stands for we are often labeled with being all about “cows, plows and sows.” I used to find myself strongly disagreeing with that statement, but this past Saturday I found myself taking pride in the statement. This past Saturday my team and I packed up and headed to Purdue University for the state 4-h and FFA livestock, dairy and poultry evaluation Career Development Events. Hundreds of students spent over ten hours judging several classes of livestock and then preparing and delivering sets of oral reasons. I spent all of my time that day with the livestock evaluation group. Those hardworking individuals in that contest judged twelve different classes of livestock ranging from beef cattle, swine, goats and sheep, and gave six sets of oral reasons. Those hardworking individuals spent twelve hours at the contest from 7:00am to 7:00pm. Anyone who now has the idea of “cows, plows, and sows”, I will agree with them. 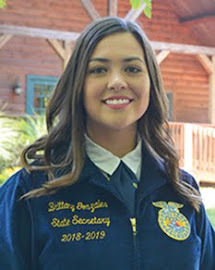 Because I do not know of any other group of young individuals who have the vast knowledge of livestock, oral speaking skills, and pure dedication to a cause…and those things are something to be extremely proud of. 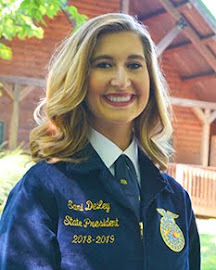 Upon getting elected as an Indiana FFA State Officer last June, my state officer team and I were immediately sat down with our superiors who then gave us a rough idea of what all we would be doing throughout the year. It was immediately made clear to each of us that we would very rarely ever have a “typical day” as state officers. Our calendar that was laid out before us for the next 365 days was packed! As I studied the calendar, there was one thing that I personally really looked forward to the most, as much as anything else, even while others may have dreaded it most. Two words: Banquet Season. 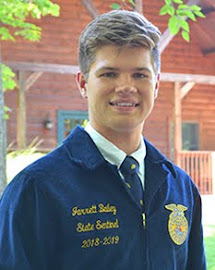 Each year, beginning in the end of March and going clear into the month of June, FFA Chapters all across the state of Indiana start having their Chapter Awards Banquets. If you have ever been to a FFA Chapter’s Awards Banquet, then you are more than likely familiar with how they are ran. However, for those of you who have yet to have the opportunity to join a chapter for their banquet, you are missing out! Typically, a Chapter Awards Banquet consists of a meal provided for the guests (free food!!!). Then, they will begin handing out awards. 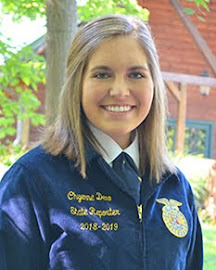 Awards typically are given out to all FFA members who participated in certain Career Development Events (CDE’s), or for certain scholarships, or for successful proficiencies, or even for having an outstanding reputation as an FFA member of that chapter. Chapter banquets can be had in high school cafeterias, auditoriums, gyms, or even in a rented community building. Each chapter banquet is unique. 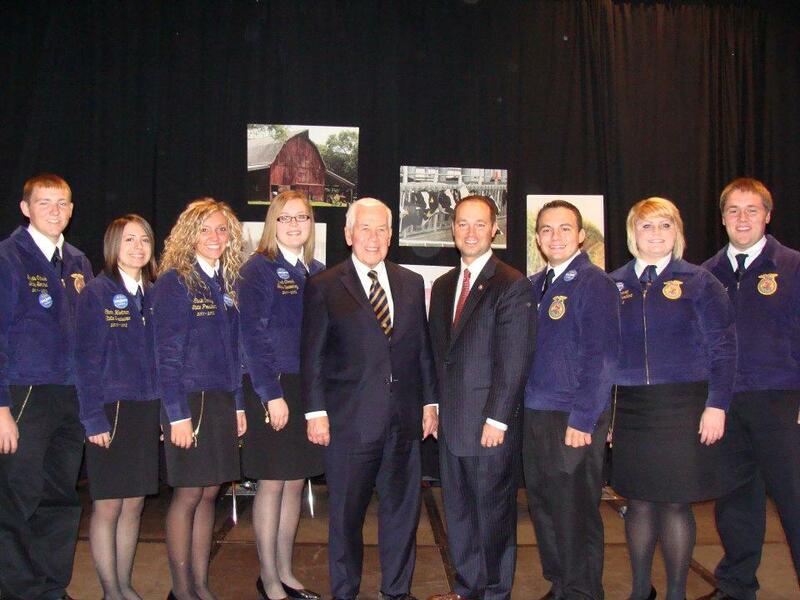 Occasionally, an FFA Chapter will feature a keynote speaker during their banquet. 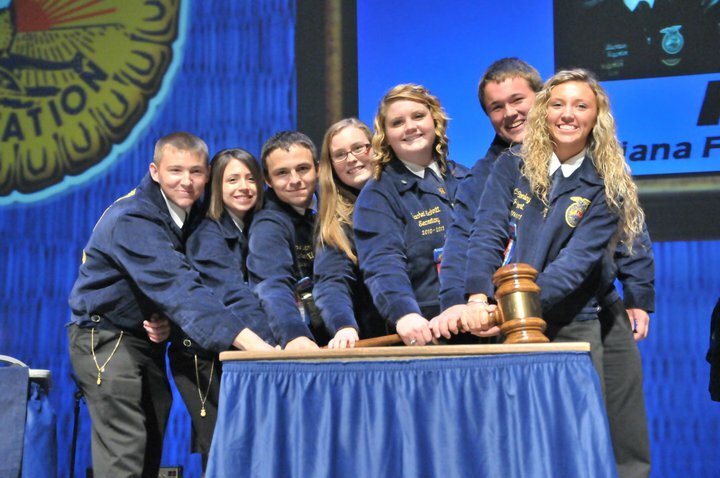 Typically, that keynote speaker is one of us seven Indiana FFA State Officers. Mt. Vernon @ MV, Kankakee, Scottsburg, Tri-County, Hoosier Hills, Tecumseh, Whitko, Springs Valley, West Noble, Blue River Valley, Lakeland, South Putnam, Owen Valley, Connersville, Columbus, North Harrison, Star Academy, Trinity Lutheran, Hamilton Southeastern, Madison, Danville, White River Valley, North Davies, Hagerstown, Whiteland, Heritage Hills, Whiteland, Southmont, East Central, Western Boone, South Decatur, Northeast Dubois, Seeger, Seymour, Orleans, Bellmont, Cloverdale, South Adams, Plymouth, Carroll @ Ft. Wayne, South Ripley, Crothersville, North Decatur, McCutcheon, Prairie Heights, Union City, Heritage, Columbia City, West Washington, Warsaw, Caston, Knightstown, Sheridan, Benton Central, Mt. Vernon @ Fortville.